07:00 Welcome to our live coverage of the most apocalyptic Friday in the history of Fridays ever. Not only are temperatures due to hit record-breaking meltdown levels, but catastrophic storms are due to break out across the country ending our summer heatwave, and the face of the moon will drip with blood in the eclipse of the century. All that and Love Island too! Stay with us as the doom unfolds. We can't wait! 07:11 Ever used London's 9 most refreshing fountains? 07:15 Wow wasn't it baking last night? We hardly slept as we sweated through the early hours and the mozzers feasted on our exposed skin. Apparently it might have been London's warmest night ever, although overnight data suggests it actually wasn't. 07:28 The Met Office says it's already hotter this morning than it was this time yesterday, so it looks like that record-breaking meltdown is definitely happening, folks! 07:46 A line of torrential showers passed north up the country last night, but they only crossed Romford so totally missed all of us here in proper London. 08:00 Yesterday was the hottest day of the year so far, with Wisley in Surrey hitting 35.1ºC. 08:01 Previously Monday was the hottest day of the year so far, and before that 8th July, and before that 26th June, and before that 25th June, and before that 28th May, and before that 17th May, and before that 20th April, and before that 18th April, and before that 6th April (etc etc etc all the way back to 1st January). 08:23 Who doesn't want to see the penguins at London Zoo eating ice lollies?! 08:30 There are precisely 12 hours to go until the longest total lunar eclipse of the century begins! 08:31 Unfortunately in the UK the moon will be below the horizon when it begins, but ssssh, best not mention that. 09:00 If you thought your morning commute was sweaty, wait til you have to go home again! 09:05 Plan your commute home now using the Air Conditioned Tube Map. 09:27 It's currently pouring down in Kings Lynn, Sheffield and Scarborough, but what use is that to us here? Apparently a big thunderstorm will hit London at 2pm if you believe the BBC, but it'll be dry until 6pm if you believe the Met Office. 09:54 An LBC journalist took a cheap plastic analogue thermometer on the tube yesterday and got some absolutely definitive temperatures for how hot it is down there. 36 degrees on the Central line? Wowsers! That's almost a whole degree warmer than it was above ground. 10:00 The UK's hottest ever July temperature was 36.7ºC on 1st July 2015. We're bound to beat that today, based on no scientific foundations whatsoever. 10:17 It's now 47 days since it last rained in East London. But will we get to 48? 10:39 Lunar eclipses used to be entirely overlooked except by nerdy geeks, but since being rebranded as a 'blood moon' they have become the most-shared social media phenomenon of all time. 11:00 It may be scorchio in London today, but tomorrow temperatures plummet to 23ºC, then to 20ºC on Sunday which will also be a wet day, like what a proper British summer used to be. 11:08 There are ghastly rumours that today's hottest temperature may not be in the capital at all, but somewhere in East Anglia. Tibenham Airfield in Norfolk has already hit 31.4ºC and it's not even noon yet. Lawks a mercy! 11:25 Chessington World of Adventures has had to close today because of a burst water pipe, because it turns out copying news items from other liveblogs is easy. 11:57 The latest hydrological bulletin reveals that Eastern England has seen an average of just 2mm of rain so far this month, and only 11mm since the start of June. 12:00 You're reading our live coverage of what could be a slightly apocalyptic Friday, with temperatures maybe due to hit record-breaking meltdown levels and catastrophic storms possibly breaking out across the country etc etc. Stay with us as the potential crisis unfolds. 12:02 It is being reported that a corner shop in Perivale has run out of Calippos. 12:41 Tesco in Bromley-by-Bow has also seen a run on own-brand Cornetto-lookalikes. 12:45 Is it hot enough to cook an egg on the pavement yet? 12:53 That 2pm storm the BBC promised has vanished, to be replaced by a 7pm shower. Meanwhile the Met Office is now suggesting no rain at all until Sunday morning. 13:00 If you're at work this afternoon with nothing else to do, why not watch the London Olympic Opening Ceremony all the way through. It took place the last time 27th July was a Friday, six years ago, before Britain collapsed into a seething pit of bitterness and self-hatred. 13:10 Today's hot sweaty afternoon is your last opportunity to contribute to the April 2019 baby boom. 13:49 Legend has it that when rain finally returns to east London, Wanstead Flats will immediately be covered by a carpet of small yellow magic daisies. 14:00 Imagine how awful it would be if clouds and rain this evening prevented you from Instagramming tonight's blood moon. The next one's not visible until January 2019, and you'll have to be up at 5am to see it. 14:01 That 2pm thunderstorm totally failed to materialise. 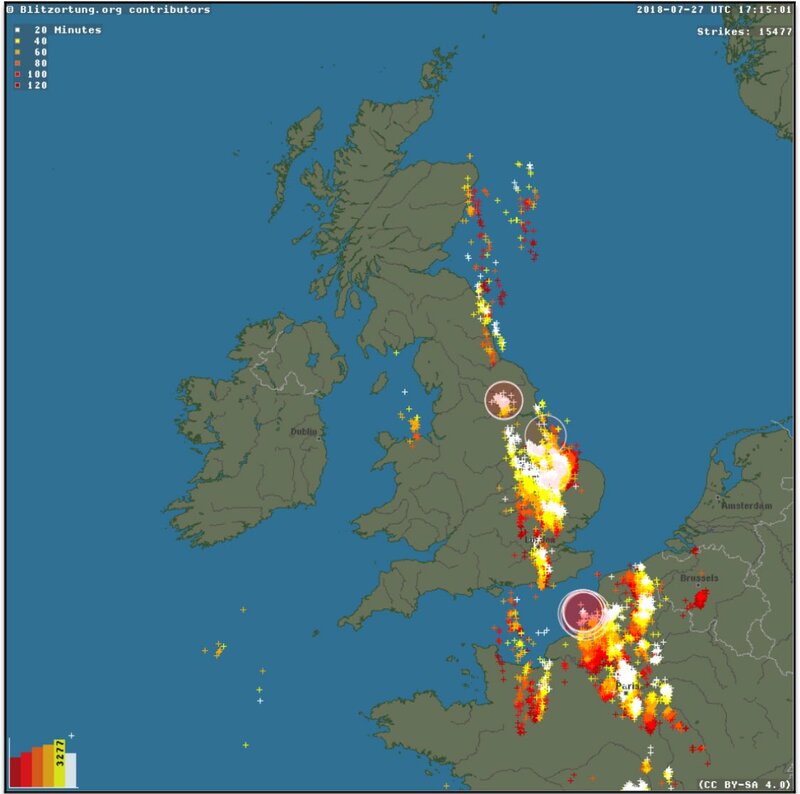 Currently the nearest thundery downpours to the capital are in North Yorkshire, Belgium and off the French coast at Cherbourg. 14:29 Are these the world's coldest icebergs? 14:44 If you pop down to your local supermarket this evening, all the barbecue meat should be on special offer. 15:00 According to rainfall radar, heavy downpours have broken out in part of North Norfolk, while the storm in the Channel has come ashore near Selsey Bill and will absolutely definitely hit London later, unless it doesn't. 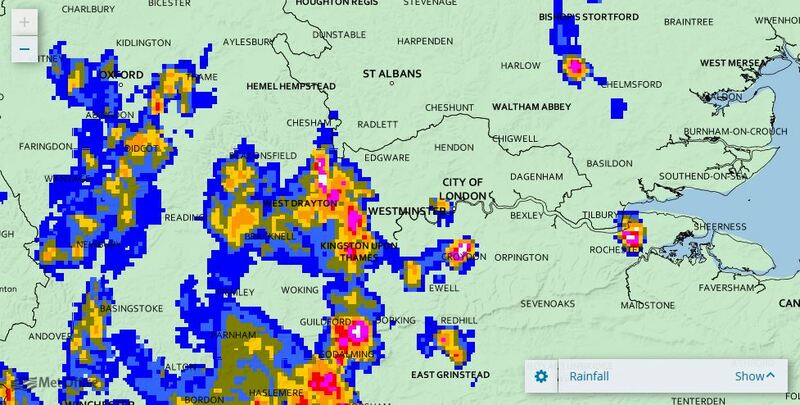 15:26 Rain is happening in Orpington, Bexley and Dagenham (but not further west). 15:31 Tibenham Airfield seems to have topped out at 35.3ºC which, if confirmed, would make it the hottest day of the year so far. 15:50 Dagenham downpour heading off into Essex. Proper cloudburst barrelling north towards Staines and Heathrow. 16:00 During a blood moon, the lunar disc magically becomes so big that people think their phone can take decent photos of it. 16:11 Actual rain in southwest London, and sort-of Croydon-ish, and a bit of the West End. 16:19 Wind's getting up in Bow, and it's clouded over, but currently all the precipitation is a bit further west. 16:52 General disappointment in west and central London that it didn't rain more. General disappointment in East London that it hasn't rained yet. 16:58 The Met Office has confirmed that today's top temperature is provisionally 34.7ºC at Tibenham Airfield... so not the hottest day of the year, nor any kind of record. 17:00 The next wave of storms, which has been rushing up from East Sussex, looks like finally dumping across southeast London. 17:08 Finally in Bow: rumbly skies, a torrential downpour of something we used to call rain, and my neighbour dashes indoors off the balcony clutching his laptop. 17:18 Nearly managed ten minutes there. 17:21 It rained in Wanstead! It rained in Wanstead! So ends a drought lasting 47 days, 20 hours and 6 minutes. 17:24 Rain's back, in a muted subtropical manner, with intermittent flashes. 17:47 Plenty more rain incoming. 18:00 Temperature's dropped more than ten degrees. Which is nice. 18:20 Blimey, there's that relentless deluge and thunderstorm they promised. Flash bang wallop. 18:37 Commuting to work in shorts this morning no longer looking like the best option. 18:49 Looks like tonight's blood moon will be clouded out, lads. 18:56 Console yourself that at least you weren't in northwest Norfolk this afternoon (unless you were, sorry). 19:00 So ends our live coverage of a non-catastrophic Friday when temperatures failed to hit record-breaking meltdown levels and the threatened thunderstorms took their time to materialise, but at least the summer heatwave ended and it did actually finally rain. Thanks for reading along.